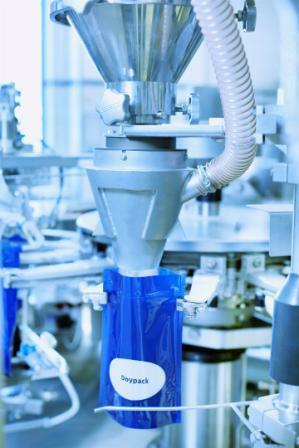 SternMaid, Wittenburg, Germany, demonstrated its latest capabilities in blending and filling of powdered food ingredients and food supplements at the Food Ingredients Europe (FiE) exhibition which took place in Frankfurt during the last three days of November. The company’s focus this year was on the new option of filling products into stand-up pouches. The contract manufacturer offers the entire service chain, including purchase of the raw materials, packaging, warehousing and delivery – all from one source. Customers can either take advantage of the whole package or choose individual modules, according to their needs. In order to respond even more flexibly to customers’ wishes, SternMaid invested in a Doypack line at the beginning of this year. That means the co-packing service provider can now fill products like dry beverage bases, superfoods and dietetic drinks in powder form. Besides retail packs, industrial containers such as sacks, fibreboard boxes, drums or FIBCs can be filled too.